There’s something you need to see. They say hindsight is 20/20, so let’s begin at the end. 3 and the Negev, and the circle of the valley of Y’reykho, the city of the palm trees, until Tzoar. 5 And Mosheh died there – the servant of YHWH – in the land Moav, according [to the] mouth of YHWH. 6 And He buried him in a valley in the land of Moav, opposite Beyt-P’-or, and no man knows his grave until this day. 7 And Mosheh was a son of one hundred and twenty years at his death; the eyes of him had not weakened, and neither was vigor lessened. The end of the ministry and amazing life of Moses is such. Standing on the precipice of the Promised Land, he passed from life, gazing at the panoramic focus of his entire ministry, but Divinely denied entrance. It is easy to place our perspective on the fact that he could not enter, which holds an important lesson for us all, but perhaps we can examine some details in this and find something more, something of inspiration in this otherwise unfortunate fact. Look at it like this: Moses is told to climb a mountain at the very end of his life, and to look out over the expanse of the land that was to be the inheritance of the twelve tribes. That is a little odd to ask, don’t you think? This simple command is significant, however, for it is found in three other places in the Torah, as well, in: Numbers 27:12-13; Deuteronomy 3:25-27, and 32:48-52. These passages all tell us the same thing: Moses must ascend this mountain, view the entire land, and then he will die. The reason for his prevention from going into the land is an account preserved for us in the Torah's book of Numbers 20:7-13, where Moses was told to speak to the rock to give water to all who thirsted, and he instead struck the rock with his staff, resulting in a judgment barring him from entrance into the land promised to Israel. This call laid out in the above section of Torah to ascend to Nebo and see the land is at the beginning of the book of Deuteronomy, in 3:25-27, where Moses pleaded with the Holy One to at least be able to enter. 26 And YHWH crossed over me, on your account, and would not hear me. And YHWH said to me, “For you – enough! Speak to Me no further with this matter! The Holy One would not allow His servant this one last request, but instead, made it an important matter to make sure that Moses was to look at the entirety of the land of our inheritance: from all directions, from the sea to the crossing of the Jordan, he was to cast his eyes. The humility of Moses was such that he did not question further the decision of the Holy One. He accepted his fate to see the land from afar. Hopefully we can perceive in this command the grace of the Most High in the detail provided in the initial passage quoted that ended in Deuteronomy 34:7 – the eyes of Moses were not weakened. This detail should be of great interest to us. The nature of the eyesight problems of our forefathers is mentioned first with Isaac (Genesis 27:1), where we are told that his eyes were “weak” (the same exact Hebrew term used of Moses in the verse quoted above, saying that his were not), and then again with Jacob (Genesis 48:10), where we are told his eyes were “heavy” and he could not see. There seemed a proclivity towards vision troubles among the patriarchs. However, with Moses, this was not the case. At the age of one-hundred and twenty, his eyes had not even begun to weaken, providing him the ability to see as sharp as he had in his youth. This detail provided in Scripture needs to be appreciated. Moses is blatantly said to have possessed both the sight and the strength to make the mountain climb and to perform the command given to him to look out over the land of promise. So, understanding all this, what is the significance that he should perform such a deed? Why the need to climb this mountain of all mountains and see the land that he was forbidden to enter? It is my belief that the Holy One commanded this of him – to climb and to see – so that his great faith could be rewarded. He looked with the eyes of the flesh, but do not think for a moment that through them alone he saw the land. No, he stood atop Nebo, at the grand summit, looking over into a land that had been promised to his forefathers, and in that parting gaze, in that final obedience to a command from the Most High, he saw with the eyes of faith the land of inheritance, the land that would be home to his people. He looked at the now, but he could see also what would be. It was yet a land empty of any Israelite, yet would one day be filled with every son of the seed of Abraham. He could see through time with faith that the people would enter, would conquer, and would establish a nation to be a light to the world. ​For it is by trust we are walking, and not by sight. Even so, we are physical beings, and this walk of faith must find that trust established in what we know first – our sight. The Holy One thus preserved the sight of Moses so that he could use the physical to see the scope of what trust would bring. It was a call to Moses to trust the Most High, really, one last time. A man of such astounding trust was given the opportunity just moments before His death to entrust the entire nation of Israel and our future into the hands of the most competent One of all – the Holy One of Israel! Moses looked at the now to see with the spirit the future of Israel. With eyes of faith, he was able to look and know He could trust they would be all that the Holy One had said they would become. This could only be accomplished by going up to Pisgah, to Nebo, and seeing with prophetic eyes while looking first at the physical. Moses had to obey this command. But why? Why look from here? Why climb and climb on this mountain? And he took him [to] the field of Tzofim, unto the head of the Pis’gah, and built seven altars, and burnt a bullock and a ram on the altar. And Balaq took Bil’am [to] the head of the P’or, that looks upon the face of the Y’shimon. From atop Peor he made his final statement to Balak concerning what he saw with prophetic eyes: a future where Israel would be more of a force to be reckoned with than they were even at that moment. Yes, it took Balaam a bit to finally get to the meat of his futuristic testimony, but it revealed something very intriguing that helps us appreciate more how looking with the eyes of faith can make us see more than what the eyes of the flesh can behold. The actual content of his prophetic statement, the astounding vision he saw as he looked out from the mountaintop and beheld Israel, was that of a star that would signal the final destruction of all in the kingdom of darkness. 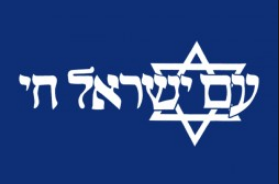 This is obviously a symbol for a descendent to come from the people of Israel – a star as the code for someone who would put an end to everyone like Balak – the Messiah. He did not see this in the now as he looked over the tents of the children of Abraham, but in the future. He saw star and scepter – symbols of a king, of a rule – of a nation established in the earth! He had to look not by sight, but by faith to see more than what lay before him down below in the scattered tents of Israel. Just like Moses had to extend his vision to something beyond the physical features of the land, to see the fulfillment of the promise of a land filled with all the souls of Israel, so too did Balaam’s vision atop the mountain reveal what was to come. Even though Balaam was given special sight to see down the halls of time to the coming of a kingdom and a king who would be a light and a leader in the world, the vision did not mean that Balaam was a prophet who would be a part of that people. No, he did not curse, but bless, but this did not make him kin to the men and women he saw from afar. Rather, there is a mention of who are the followers of Balaam, and who are the followers of his opposite. In ancient Judaism, the teachers were able to draw a connection between the nature of the disciples of Balaam and the nature of the disciples of Avraham. More precisely, they saw a distinction between the two, and stated it in the last few sentences of the Mishnah, in Avot 5:22 [5:19 in Jacob Neusner’s popular translation] (using an 11th century manuscript in the accompanying photo and fresh translation here). Of all the prophets that could have been compared to Balaam, the teachers of old found intriguingly the perfect opposite in Abraham our father. What did they see as comparative between the two? The link they saw was sure, as we will find all the way back in the book of Genesis 15:1-6, where we read of our father Abraham and a most interesting event in his life. 6 And he trusted in YHWH, and He reckoned righteousness to him! And thus it is that we can see the true link between the two: Balaam looked out over the land and saw the people of Israel in their grand formation. He saw them at their weakest and yet in that, saw their glory. Balaam spoke also in the prophetic eye of seeing a star come forth from them as he looked at the multitude of the people of Israel. He saw that star making a difference in the world. In like manner, with this account of Abraham in the above-cited passage, we find that he was told to look up at the stars and take note of them: each one of them shone decisively for a future descendant, those who would be a blessing in the world. He looked at those stars with the eyes of flesh up into that night sky, seeing the twinkling lights so brilliant in the heavens, and he knew each one stood for a descendant, and heir, not yet born. He saw with eyes of flesh and of faith the future for his family. 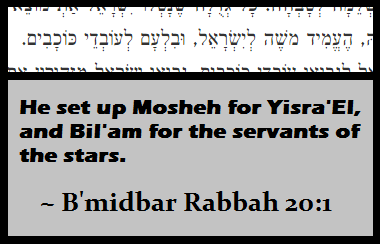 Interestingly, the Torah speaks of the descendants of Abraham as stars in nine places! See: Genesis 15:5, 22:17, 26:4, 37:9; Exodus 32:13; Numbers 24:17; Deut. 1:10, 10:22, 28:62. The light of the stars streamed across untold distance through the depths of space, photons journeying since well-before the birth of Abraham to reach his eyes at just that moment. In this was the promise of the Holy One contained: Abraham could look into the past of the starlight trails and see that the Holy One had planned a grand future for him: a people would come from him somehow, and the promise was thus as good as a sure thing. If the Most High could make a promise, then He could keep it. Descendants would come from Abraham – children who would grow up being taught the truth of what it meant to follow the Holy One Himself – disciples of Abraham through flesh and through faith! There is no difference for us. We walk in a world of sight, but as Paul wrote in the previously-quoted passage from 2nd Corinthians, we are walking by trust, and not just by sight. We see the world as it is now, the situations we have before us, but we are disciples of the one who saw the now and could trust the future to be so much more – full of the fulfilled plan of the Most High. We thus use our eyes of flesh and faith to see beyond the what-is and to the what-shall-be. We have seen the manifestation of what Moses saw as he looked out from Pisgah – a land reclaimed and restored by the living presence of His people Israel. We have seen the star and the scepter tread forth – we know the descendant of Abraham whom Balaam saw, the King who shall reign from Zion! We who are Abraham's descendants, whether by flesh or by faith, if we look with eyes utilizing both functioning in unity, we can see the hope for a bright shining future for all of us in His land of promise!